History is only as accurate as it is portrayed. What historical knowledge scholars, educators, and the general public acquire is essentially based on a reservoir of facts and interpretations that have been arranged in chronological order by past historians. Unfortunately, this string of events that we call “history” has some major gaps that have not been filled until recently. Specifically, these gaps relate to women’s roles in music history and music education. To fill these gaps is an arduous task, but to allow them to remain present is an inaccurate representation of history itself. In efforts to bridge the gaps in musical history, a closer look will be given to Joan A. Lamb and her contributions to women’s military bands, which developed as the United States became more deeply involved in World War II. After Japan’s attack on Pearl Harbor in December 1941, the United States declared war on Japan; likewise, Hitler declared was on the United States. With President Franklin Delano Roosevelt’s issuance of a military draft in 1942 men left their homes and jobs to fight. The draft sparked the change in women’s roles in society, for six million women entered the work force during WWII. In 1943, President Roosevelt signed legislation that established a Women’s Army Auxiliary Corps (WAAC), which was later changed to Women’s Army Corps. Soon after, other military branches established similar women’s branches such as the Navy WAVES, Coast Guard SPARS, and the Marines MCWR. By the end of the war, nearly 400,000 women had enlisted. After completing boot camp, these women would choose from a variety of different jobs available to them; one of these jobs was to play in an all-female-military-band. One such female military musician was Joan A. Lamb. Born in 1918 to musical parents in Ohio, Lamb began her musical training early. She first played the trumpet and later took on the cello and oboe. Lamb attended Baldwin Wallace College in Berea, Ohio where she majored in music education as an instrumentalist. In 1940, Lamb began teaching music in a rural school in Cooperdale, Ohio. She held two other teaching positions, but found them disappointing due to the lack of instruments. After her fiancée was drafted into the war, Lamb decided to research military opportunities for women. In 1942, Lamb joined the WAAC (later called the WAC) as a band member. The role of the WAC band was to boost the morale of the troops and to perform martial duties. In 1943, Lamb was ordered to attend the Army Music School in Fort Myer, Virginia where she would be trained to lead a band. 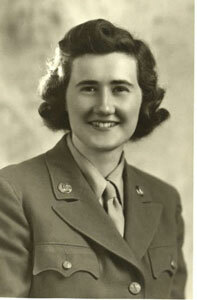 In 1943, Lamb was ordered to Fort Des Moines in Iowa to direct the 400th WAC all-women’s band. She also took on the assignment to start an all-women’s African American band—the first of its kind. Other band members recollect playing on the Seattle Port of Embarkation pier all evening as the troops departed on their ship. Lamb’s band was serenaded by a few thousand male voices singing “Goodnight Ladies” as they left. When Lamb’s position with the 400th WAC band ended, she was one of two women who joined the Armed Forces Radio Orchestra in Hollywood, California. The AFRO performed with stars such as Bing Crosby and Frank Sinatra. These performances, which occurred twice a week, were recorded and sent abroad for the troops to enjoy. After the war, Lamb was recruited to join the Hormel Girls, which was a band for women who had played in WWII bands. In 1948, she toured the country, performing in what would become a drum and bugle corps. After touring with the Hormel Girls, Lamb returned to Los Angles, where she would begin a thirty-year career as a music educator and administrator. Lamb was known for her work in including children with disabilities in her bands and orchestras; she later went back to school and wrote a thesis, which was inspired by these children. Her work in music education would later be the driving force behind the field of music therapy. Joan A. Lamb’s contributions as a female musician and educator are countless. Though her military and musical career are perhaps the most varied of any woman, she is just one of many women who made a difference in women’s roles in society. The altered role of women in the military during WWII was part of a larger event that led to long-term changes in society for women such as military integration, passage of Title IX, and the first appointment of a woman as conductor of the U.S. Marine Band. Lamb, Joan A. Interview with Jill M. Sullivan, 19 August 2003, Pahrump, Nevada. Tape recording and transcript. Gilbert, Arizona. Sullivan, Jill M. “A History of the Marine Corps Women’s Reserve Band.” Journal of Band Research 42 (Fall 2006): 1-45. _____________. “One Ohio Music Educator’s Contribution to World War Ii: Joan A. Lamb.” Contributions to Music Education 33/2 (2006): 27-51. _____________. “Women’s Military Bands in a Segregated Army: The 400th and 404th WAC Bands.” Journal of Band Research 41 (Spring 2006): 1-35.